In the Royal Palace complex there are two illustrations, the work of Ivan Yakovlevich Bilibin from the 1920s and 30s of the 20th century. Those are about two colourful graphics with scenes from The Tale of the Golden Cockerel of Alexander Pushkin and the Russian folk tale Go There, Don’t Know Where. Both artworks are colourfully highlighted with vivid details in the form of ornaments from the Russian folk art. These artworks are abundant with precisely elaborated details and symmetry in compositions. 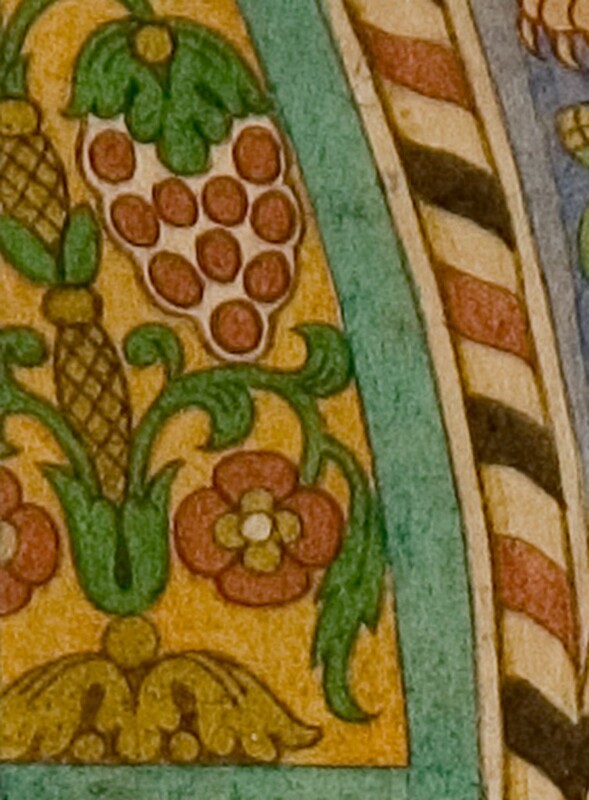 It also points out the Biljina’s unwavering attitude towards strict laws that are firstly noticed in the composition. His artworks reveal the author’s ability to find an adequate place for each figure, and they are particularly emphasized in the placement of inscriptions and vignettes. The fact that tells us about his talent and precision is the fact that he drew all the details from „his hand”. 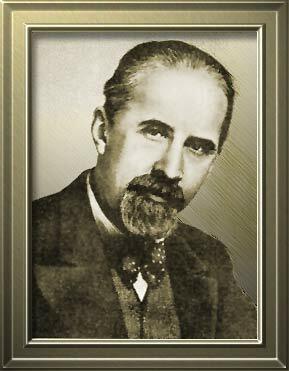 He was born in 1876 in Tarkhovka near St. Petersburg in the military doctor’s family, where he spent most of his life. 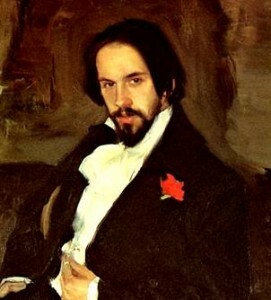 He finished law school in St. Petersburg, but the love for the art took him to Munich at Anton Ažbe Art School in 1898. A few years later, under the mentorship of Ilya Repin, he was teaching at Maria Tennysheva art studio, the Russian princess and a great patron. After the formation of the artist’s association “Mir Iskusstva” in the late nineties of the 20th century, Biljibin became her active member. 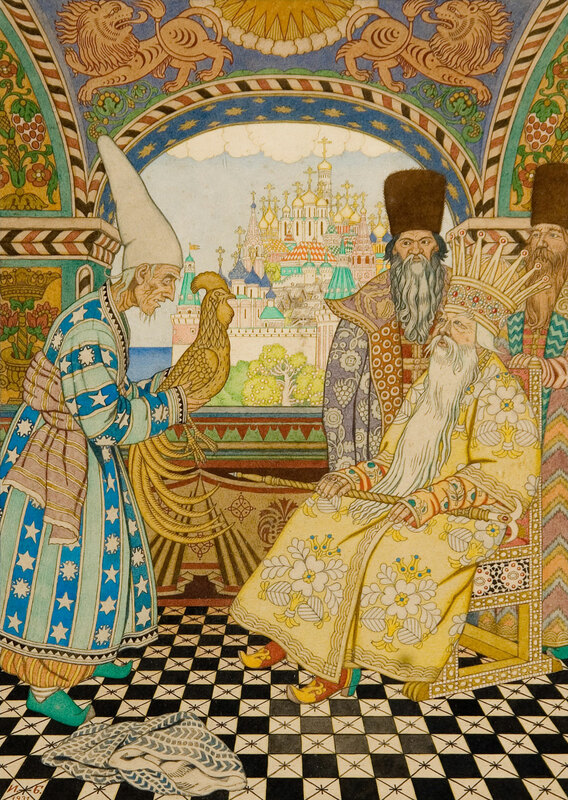 In 1899, he went to Biljibin Tverskaya guberniya where he released his first fairy tales Illustrations: The Tale of Ivan Tsarevich, Firebird and The Tale of the Gray wolf. In the period from 1902 to 1903 the Museum Alexander III entrusted him the job of collecting ethnographic material and photographs of the Old Russian architecture in Volgograd, Arkhangelsk and Oloneskoj guberniya. He is fully occupied with the Russian ethnographic motifs and transfers them to his artworks. 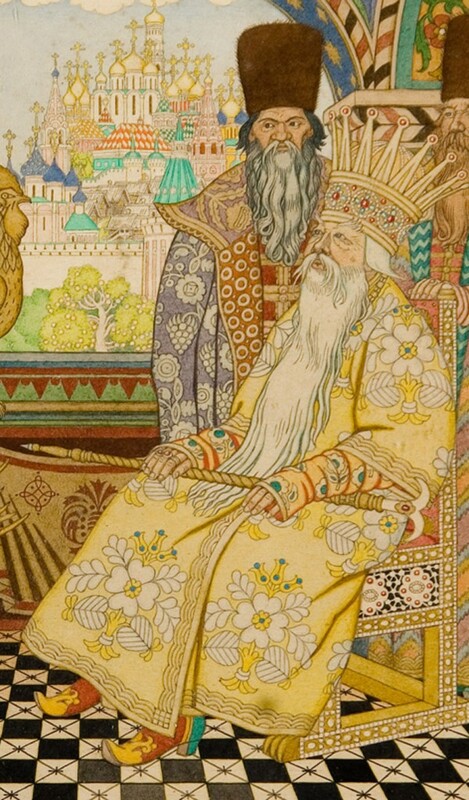 After 1902, Biljibin illustrated the serial publication of Pushkin’s fairy tales. This artist celebrated the illustrations of Russian wizards, fairy tales and other fantastic characters of Russian folklore. Firstly, The Tale of Tsar Saltan (1907) appeared, and then the Tale of the Golden Cockerel (1910) and in 1905 the illustrated epic Russian poem Volga was issued for which Biljibin made the illustrations. 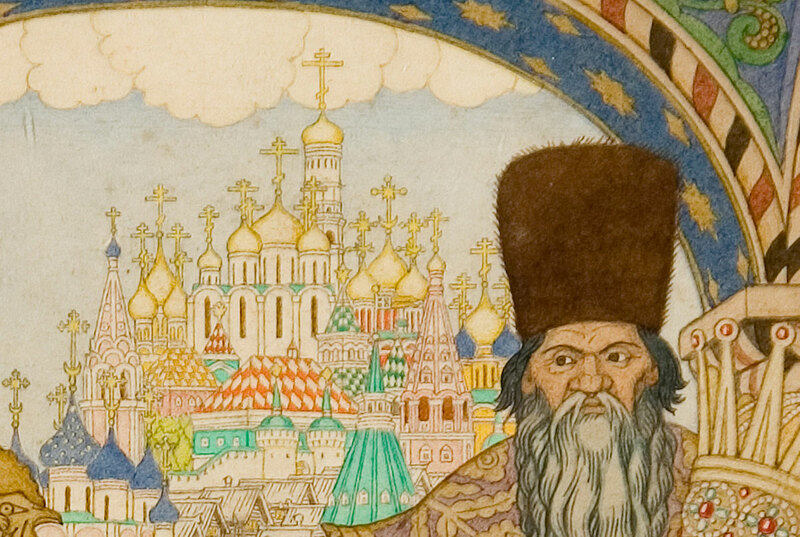 Apart from the illustrations of Russian fairy tales, he also showed himself on the scenic design. 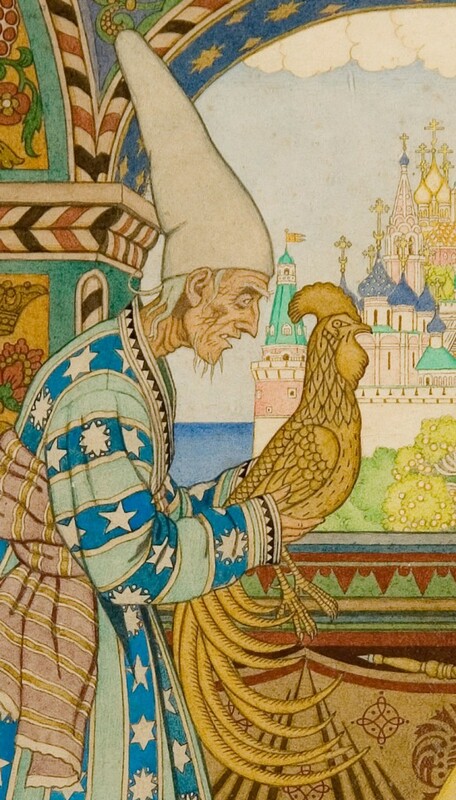 The recognizable style of Ivan Yakovlevich Bilibin, with an old-fashioned ornament and folklore motifs, appeared in the scenography of Nikolai Rimsky-Korsakov Snow White (1904), which was ordered by the Paris National Theatre. The details that Biljibin used in the scenic design were also notable in his graphic works on the news headlines. During 1905, Biljibin made caricatures, while after the October Revolution of 1917 Biljibin left Russia. Since 1920 he had been living in Cairo, and since 1925 in Paris. At that time he worked on the decoration of the opera and ballet scenes. 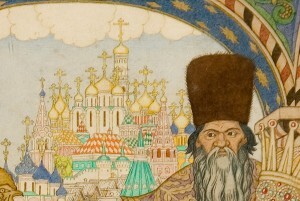 Since 1936 Biljibin had returned to his homeland, Leningrad, where he was teaching at the Academy of Arts and working as an illustrator and scenographer. He died in occupied Leningrad on February 7th, 1942, leaving behind unfinished illustrations of the Russian epic poem Duke Stepanovich.